Let’s not kid around here. If you’ve read my blog for any amount of time you’ve heard about Eipix. Because I talk about them a whole friggin’ lot. From casual remarks to mini reviews to full blow reviews, I’ve said and done it all and if you’ll remember, I tend to have a pretty negative view on them. Be it because I think they’re lazy or not doing what I know they could or because I think they might have a harmful effect on the industry, the reasons have varied. But I’ve always maintained that it’s more disappointment than anything because I actually started out loving these guys. In one of my very first reviews I mention a company in which I’m in love… and that was Eipix. I was expressing my sincerest faith in their abilities and that was a mistake. I should’ve known that skepticism is far less harsh on your hope in the long run because you don’t have to fall from as great a height. But the more of their games I played, the less stellar my view of the company became. Or at least their output. Sequels that failed to live up to my expectations, completely forgetting I even played a game and good ideas simply rendered uninteresting because of lack of understanding what made the ideas good. I’ve reviewed two of their games before, Spirit Wolf and Smithsonian Hope Diamond, and they weren’t exactly recommendations. True, reading them now is a bit cringey as I was still trying to play up the “angry” reviewer schtick that’s been popularized by the Internet and I’ve changed my tune ever so slightly since. Still, I’m not about to make an apology. However I may have worded the review, I stand by the sentiment regardless. Ever since I’ve constantly referred to them and I often wonder if I’m being unfair. Even though I keep saying I have the greatest respect for them, my actions may say otherwise and I often wonder if I bash their games simply because it’s what I do? Is that my thing? Is that what people will say about me? “That Swedish Guy that hates Eipix and reviews HOPA!” I hope not, that was never my intention. In the midst of thinking this, I decided it was time to try another of their games, the third in the franchise that hooked me into the studio in the beginning. And this time really think about why I had the reasons for disliking the games that I did. Your family has had its fair share of tragedy ever since your father, a world renowned director, passed away. Since then you’ve been wrapped up in one insidious plot after the other. Every time you managed to get the better of your opposition and it seemed like your father’s sordid past was finally behind you. But when a string of murders inspired by your father’s movies start you’re pulled into another mystery. Worse yet, the murderer seems to be targeting you and your family and somehow it all relates back to something that your father did in the military. It seems you will never truly be free of the Wolf family curse. Final Cut: Homage is the third entry in the Final Cut franchise, a series of games primarily centered around movies and the Wolf family (at least as far as I have played). But the first two games centered around a magical, sorry, highly advanced camera that… well, did different things depending on what the game needed it to. At first it merely drove people insane but by the second game it put 3D cameras of today to shame, taking 3D to a whole new level by projecting entire scenes into the real world and anyone caught in the projection would become part of the scene. This time, however, the stakes are completely different. Though the camera makes a return appearance, this time around it’s merely one of the tools used by a psychotic murderer who’s hellbent on making you the leading star in his movie. The movie being real life, of course. He’s psychotic so it makes sense he’d act like a psychopath. So instead of simply being tossed into an adventure, this time there’s much more of a detective noir feeling over the whole thing, a murder mystery to be solved and fiendish traps to be solved before people get killed. And hearing the Director, that’s what he calls himself, taunting you and continuously leading you to more traps is fantastic. Though not exactly original, the execution of it is spot on and that’s more than enough for me to enjoy it. There were a few things I didn’t like, though, consequences for failing were non-existent so even if the Director continuously taunted you and set arbitrary time limits, I knew there was never any real threat. Having a time limit and actually enforce it, resulting in different endings would’ve made the game that much better and turn the whole thing into a proper nail biter. And if you’re worried about scaring players away, don’t be. Because, again, difficulties are the way to solve that: playing on Casual means no time limit, play it on Challenging, have the time limit. The thing about threats is that they only carry weight as long as you believe the person issuing them is capable of actually doing it. This carries over to games as well; if I know it’s just an empty threat it loses its edge, making the game lesser for it. 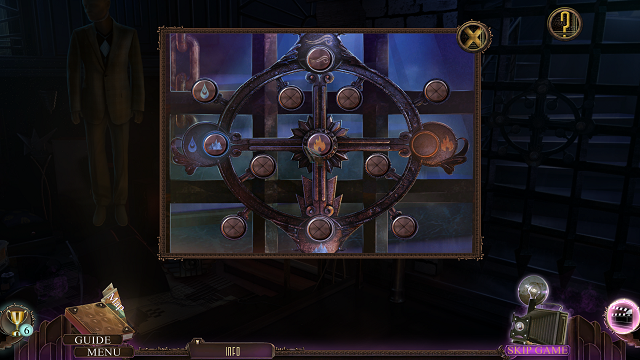 Again, HOPA is meant to be for everyone and that includes those that want a serious challenge and this is just one little trick that would add exactly that. It’s not even that hard, whether your friends and family survive the night or not has no real bearing on the ending so the only thing they needed to change was a few of the ending slides, dialog and such and the game would’ve been much better for it. The only other thing I want to say about the story is that its roots in classic noir meant the villain wasn’t all that difficult to figure out early on. There’s only a handful of characters in the game to begin with and there was bound to be a twist. That said, the fact that they tried their hand at a clever twist, no matter how traditional, is enough for me to give it the thumbs up. The build up works and I appreciate the effort since it’s more than a lot of games try to do. But as I’ve said many times before, the game can’t rely on story alone… well, unless the story is amazing. 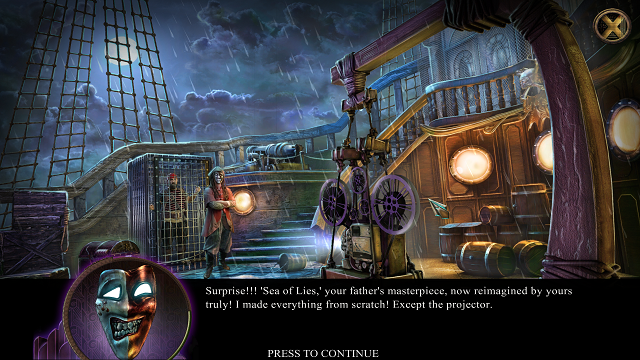 Luckily it seems Eipix really pulled out all the stops for this installments because the gameplay rarely felt lacking. One that thing that I absolutely loved was the addition of a world to explore… kind of. You start off outside of a hotel and need to go back to you family’s mansion. How do you do this? By car, of course! Yes, no longer are you confined to a single area but instead get to jump in your car and drive to different areas. True, it’s not much in the way of freedom as you’re only allowed to go where the game wants you at the time and you unlock locations as the story progresses… but just the inclusion of such a thing meant the world felt a lot bigger and that you were in control of your own path. I wish there had been a bit more travel between areas, some areas you only visit, figure out what needs to be done and then leave again, never to return which is a shame. Of course, that’s a balance act as too much travel back and forth would’ve been tedious. 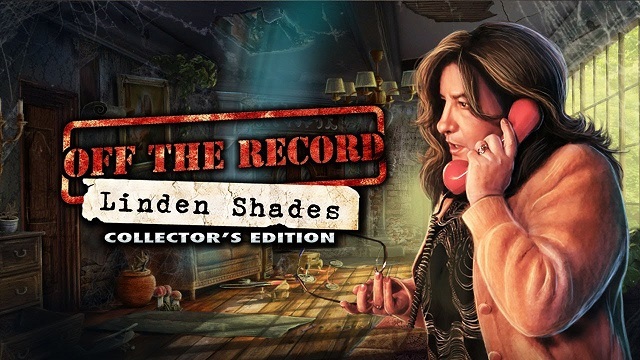 That’s just window dressing, really, what matters is the actual gameplay, the hidden object scenes and puzzles and… they definitely work. 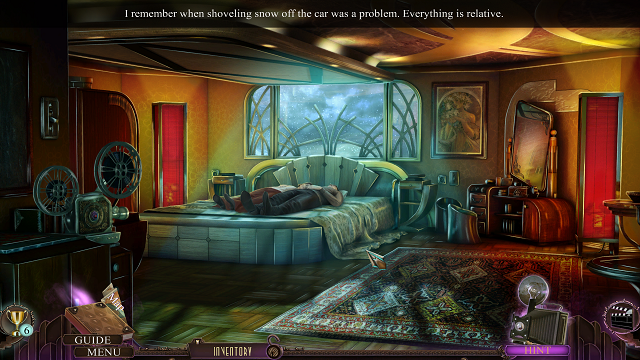 The hidden object scenes themselves are very varied and some are just one, long, interactive chain of things and others are just straight up lists. 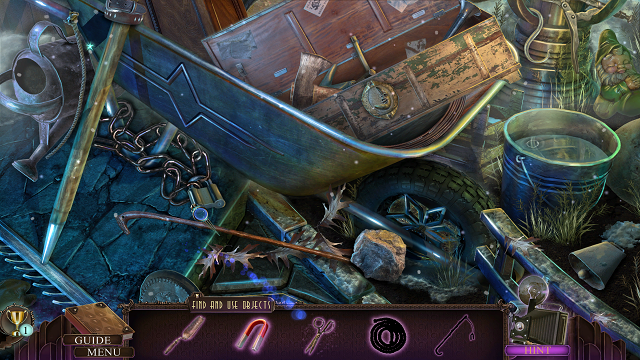 The “mini scenes” make a triumphant return and in spades, too, adding small, quick hidden object scenes without becoming a slog. No scene ever overstays its welcome and they struck a pretty good balance between challenging and easy. Puzzles, as always, is where I’m the most disappointed but for an Eipix game to come away as “it was alright” is a big step in the right direction. There weren’t nearly as many non-puzzles as I expected and while many puzzles were just a tad bit too easy, I’ll take easy puzzles over none at all. And then there were a few that actually did test my mettle. Not to the point where I felt I needed to skip but some really tickled my fancy and had me thinking things through more than once. There were a few puzzles that I’d call minigames but they’re welcome too. Too many puzzles lacked a failure state, though, and not nearly enough of them threw spanners into the works to complicate matters. Those that were easy or average were far too susceptible to a brute force approach which is fine if there’s not too many of them… which there was. But on the flipside there were some pretty clever versions of standard puzzles mixed in which pleased me to no end. The maze puzzle right at the beginning was friggin’ cool even if it wasn’t particularly challenging. I can really only think of one major strike against the gameplay and it’s a design thing I’ve noticed in other Eipix as well, though they’re not alone when it comes to this. They place interactive objects and areas far too close to the bottom of the screen which more than once resulted in my moving backwards to a previous area rather than interacting with the object. If it was just once or twice that it happened, I’d just chalk it up to bad luck but it happened multiple times and once or twice trying to interact with the same place. Now, this is an Eipix game and one department they never really fail in is the graphics but even for an Eipix game this looks amazing. Everything from the environments that look like something that would fit in old Hollywood; era appropriate clothes, furniture and architecture, all rounded out with just stunningly beautiful 2D art and some actual 3D art mixed in. I wish they’d done more with this, like turning and examining them on your own. 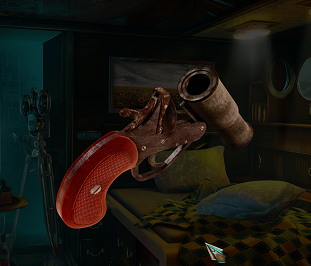 For instance, in the case of this flare gun, it’d be fun to get to turn it around, figure out how to open it then turn it so you can put the cartridge in and then closing it, making the whole thing an interactive 3D puzzle. The models turn and show themselves off to the player as it is, anyway, so it shouldn’t be that hard to incorporate. And there are a lot of interactive objects as well, couple that with being allowed to drive where you wanted and suddenly you have a much more engaging and free world. At least on the surface. And again, if you were afraid this would scare some people off, have a difficulty setting for this as well. If set to the lowest, it’s pretty much automatic. Raise it to medium and how to interact with the object is highlighted and if at max difficulty, you have to turn and figure out the object on your own. That might mean you’re gonna have to put a little bit of extra time in making these things but as someone who studied programming, not a hell of a lot of extra time. Yes, I will continue to complain about the lack of difficulty settings until someone listens. It’s my white whale. Another thing that I really liked was the inclusion of live actors AND 2D animated characters. Not only were the 2D animations way above what they normally are, I found this be an acceptable compromise between live actors and 2D cutouts. For more complicated movements and cutscenes, use an actor. For simpler movement and dialog, use animation. It just worked so well together that I really hope Eipix stick to this even after this game. At least in some games. So! Is it a good game? Well, yes, I actually think so. It’s been a while since I felt any sort of passion in Eipix’ games but in this one I felt it in spades. Overall it was just so well put together that even with the flaws, it’s hard to stay annoyed very long. 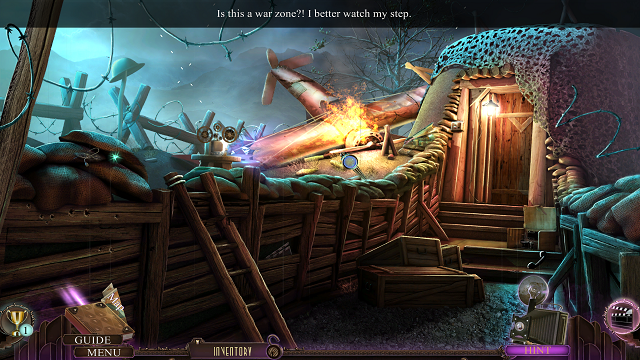 The graphics and the story and the gmeplay there work together very well to craft an enjoyable experience. Is it perfect? No, but it doesn’t have to be, either. But it is bloody impressive and shows why Eipix is one of the leading companies in HOPA today. So, relating back to my question at the beginning: am I wrong? And believe it or not, I’ve got an answer: no. Just because I enjoyed this game doesn’t mean that I was wrong about previous games. If anything, it goes a long way to show that I’m not entirely biased. I wasn’t out to crucify Eipix, they were just an easy target because they’re as high profile as they are. Meaning more of their games are gonna enter my crosshairs. And I’ve always… well, most often said that it’s ultimately just my opinion. I’m not unbiased, I don’t believe such a thing is possible nor that it is desirable when it comes to reviewing games. But that’s just my opinion. Take it or leave it.